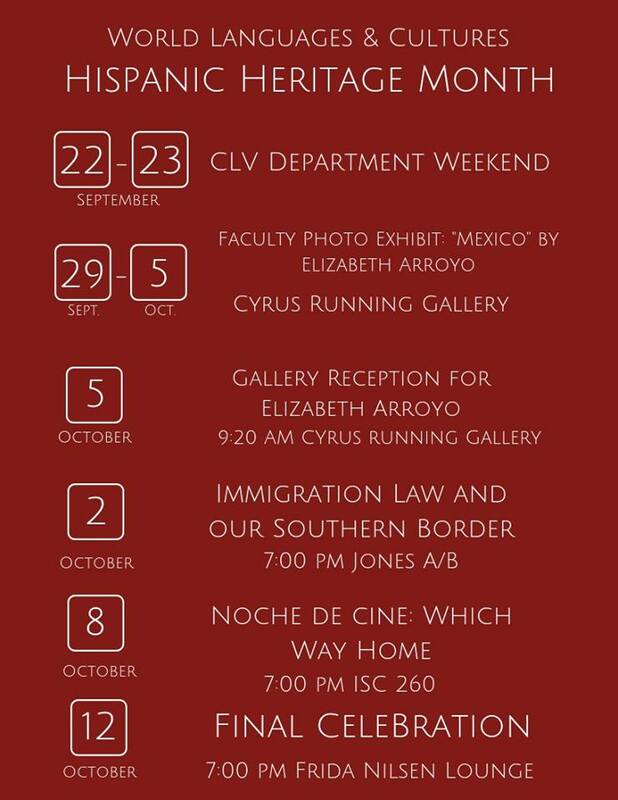 Schedule of events for Hispanic Heritage Month on Concordia’s campus. Every day, every week and every month, it seems like society is bombarded with a different focus. Whether that be a celebration of national dog day or national pancake day, there’s always something to be celebrating. This month comes with something much more than just a time of recognition and excuse to take cute pictures of your pet or get free breakfast, but a month of true celebration. A celebration for a culture that cohabits a nation once not lived in with so much solidarity. Hispanic heritage month spans from Sept. 15 to Oct. 15 on a yearly basis as Americans observe, celebrate and learn about the contributions of American citizens who have Hispanic heritage. Five Latin American countries celebrate their independence days on Sept. 15 and many others do so close to that date as well, making it a perfect time for an overall celebration. Hundreds of thousands of American citizens take part in the festivities of the month along with others around the world and even on the Concordia College campus. Karin Hillstrom, a Spanish professor at Concordia College, was born and raised in Buenos Aires, Argentina. She is a second generation German that lived in Argentina and had the chance to grow up bilingual. Hillstrom expressed that she enjoys seeing the recognition that the Hispanic culture gets in the United States, but shared also how different the celebration varies from her home country. “At home we eat Argentinian food and celebrate things the way we do in Argentina. Family is the most important thing. We work to live, we don’t live to work,” Hillstrom explained. Hillstrom hopes that this month helps people of all backgrounds and cultures to embrace the Hispanic culture and honor the traditions they hold so dear. Lisa Twomey is an associate professor and also teaches all levels of Spanish at Concordia. She, alongside Mark Melby, who is the administrative assistant for the World Languages Department, helps prepare for the Concordia campus celebration of Hispanic heritage month. They shared that every year, the celebration seems to differ. This year is a little different, though, as there will be fewer events, but the ones that will be represented are important and need to be focused on. Thanks to Twomey, Concordia got to meet an attorney who works with law at the southern border working with family separations. “These events are really born from the idea of trying to educate, especially with what’s going on right now, and the other events are about having fun and celebrating such a varied culture,” said Twomey. Along with the guest speaker, there will be a documentary showing, a fiesta and many other events spread throughout the rest of Hispanic heritage month. “We have Hispanic people on our campus, in our community and nationally,” Twomey said about why it’s important that Concordia participate in this celebration. Within every culture and language, its more than meets the eye. Take some time this month to broaden your understanding of the Hispanic culture and celebrate with millions around the world who share this heritage and interest.